Pictured above: Tourists soak in warm waters of the Gardner River while Montana State University graduate student George Platt (center) collects a carboy of water for the study of brain-eating amoebae. As MBARI technologies evolve over the years, they often make impacts in ways never envisioned at their outset. In 2017, one of MBARI’s key instruments for detecting microscopic organisms in the ocean was put to a new use aimed at protecting human health. The Environmental Sample Processor (ESP) was sent to Yellowstone National Park to see if it could monitor tiny but potentially harmful amoebae that live naturally in warm waters and can sometimes cause serious brain damage in humans. 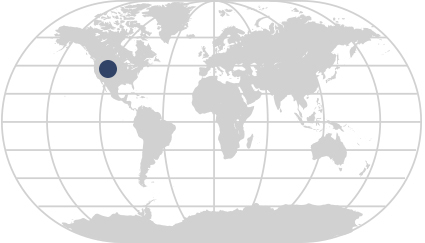 When MBARI was founded in the late 1980s, tools and techniques developed for biomedical use were advancing rapidly and having a phenomenal impact on society. The same tools created for detecting important genetic pathways and disease-causing organisms were also being used to make many groundbreaking innovations for observing life in the sea. By adopting DNA sequencing methods and applying diagnostic tests used for biomedical purposes, ocean scientists quickly found that they could reveal the diversity and abundance of a host of organisms in ways that were never possible before. Persistence in improving the Environmental Sample Processor, an ocean research tool, has created unanticipated opportunities for MBARI to make an impact on issues related to the health of the planet and its inhabitants. The use of such methods in the ocean sciences grew exponentially for years, but applying this technology “on the fly” in the field was impractical. Samples had to be brought back to a laboratory for processing—a stark contrast to more immediate methods available for measuring temperature, salinity, chlorophyll, and other important ocean properties. That limitation became the inspiration behind the Environmental Sample Processor (ESP), developed at MBARI under the leadership of now-CEO Chris Scholin. The goal was to create a device that would fully automate the steps of sample collection and handling so that routine molecular analyses could be carried out within the environment of interest, autonomously, below the ocean surface. One of the driving factors behind the development of the ESP was to make it possible to conduct tests without the strict need for ships and people, because, as is so often said, being there is everything. Biological processes in the ocean are ephemeral and “patchy”, and it is not possible to collect all the samples needed if it requires ships and crews to go to sea to do the work. ESPs provide presence by proxy; they can be placed in areas of interest to collect samples and other oceanographic data, sending information back to scientists or resource managers on shore via satellite or other wireless networks. 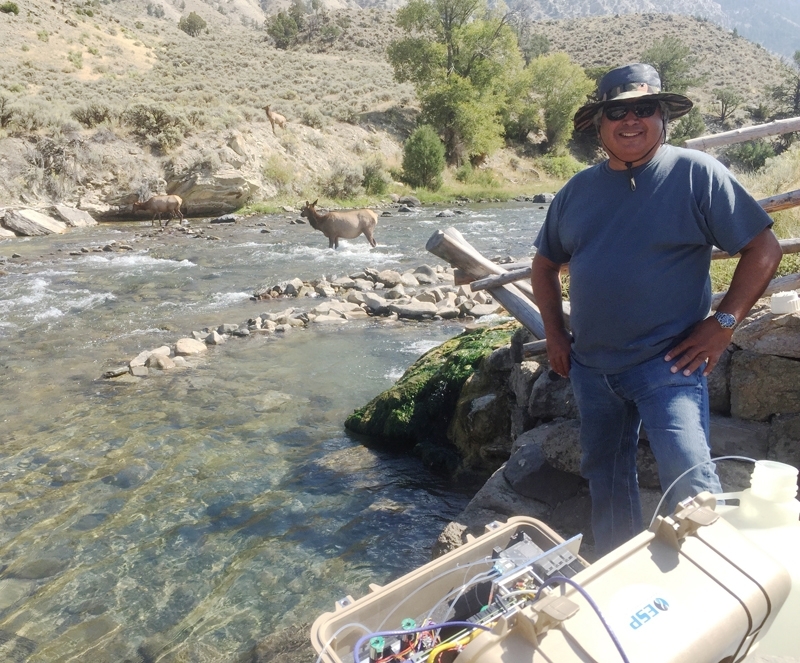 Senior Research Technician Roman Marin III using a third-generation Environmental Sample Processor to collect water from the Gardner River in Montana. Photo by Kevan Yamahara. The ESP has been successfully deployed in lake, coastal, deep-sea, and open-ocean environments—such as Lake Erie, the Gulf of Maine, Axial Seamount, and off Hawaii—where it has demonstrated its ability to detect a wide range of organisms and the substances they produce. Along the way the device has also attracted attention from groups who are charged with oversight of our nation’s freshwater resources (lakes, rivers, reservoirs). They, too, have a need to collect samples of water, sometimes from remote places, and apply biomedical-type tests for public health protection and resource management purposes. After a chance meeting of MBARI’s ESP group and representatives from the United States Geological Survey (USGS), the question arose whether the instrument could also be used to monitor streams for pathogens and invasive species. For MBARI researchers Kevan Yamahara and Roman Marin it became a unique opportunity to test out the water-sampling capabilities of the ESP in the wilds near Yellowstone National Park. The Environmental Sample Processor was brought to Yellowstone National Park. The 2017 Yellowstone experiment was a joint effort with the USGS and Montana State University to study a tiny amoeba, Naegleria fowleri, commonly called the “brain-eating amoeba”. This amoeba is found in warm-to-hot bodies of freshwater around the world, and is often found in the southern U.S. It also shows up occasionally in hot springs, water heaters, and neti pots (containers designed to rinse debris or mucus from your nasal cavity). If you get water harboring Naegleria fowleri up your nose, there is a chance that the amoebae will migrate up your sinus nerve and into your brain, where it begins consuming nerve cells. The first symptoms, including headache, nausea, vomiting, and a stiff neck, appear in about five days. In another five days you are likely to die (the fatality rate is 97 percent). Fortunately, even though Naegleria amoebae are common, brain infections are rare. According to the U.S. Centers for Disease Control and Prevention (CDC), only 40 people in the United States were infected with Naegleria fowleri between 2007 and 2016. According to the CDC, “There are no rapid, standardized testing methods to detect and quantitate Naegleria fowleri in water… It can take weeks to identify the amoeba, but new detection tests are under development.” The USGS is collaborating in the test development process, which dovetails with a larger USGS effort to place automated water-monitoring systems on stream gages around the country. That’s where the ESP could come in handy, not only in monitoring disease-causing organisms such as Naegleria or other pathogens, but also in collecting environmental DNA (eDNA: genetic material that is released by organisms into their surroundings through normal biological processes such as excretion or sloughed skin). The analysis of eDNA offers a new way to detect the presence of larger animals, such as highly managed species or invasive organisms, which have important implications for humans and wildlife alike. For the Yellowstone experiment, MBARI researchers used two different types of ESPs to process water samples from the Gardner River, close to the Montana/Wyoming border. A small, portable ESP was carried out into the field to filter and process samples taken directly from the river. An older ESP was installed at Montana State University for processing water samples that the researchers brought back from the river. After the ESPs processed and filtered the water samples, researchers shipped the material collected to USGS and CDC labs for further processing and testing for Naegleria. The analysis of eDNA offers a new way to detect the presence of larger animals, such as highly managed species or invasive organisms, which have important implications for humans and wildlife alike. MBARI’s third-generation Environmental Sample Processor is small enough to fit in a fishing tackle box. The entire monitoring setup is shown here in the back of a pickup truck near one of the team’s field sites in Montana. Photo by Kevan Yamahara. Though Marin and Yamahara enjoyed the Yellowstone scenery, it was hard work hiking to and from the river carrying batteries and heavy equipment, not to mention the 60 liters of water samples (these samples would weigh about 60 kilograms, or 132 pounds). In addition, the stretch of river where the team collected water samples turned out to be quite a busy place. The team had to work around travelers who flock to the river to soak in its warm waters, apparently unconcerned about the (minor) risk of having their brains infected by amoebae. More inspiring was a herd of elk that wandered in and out of the sampling area, oblivious to both the researchers and the tourists. This pilot project, funded by a USGS Innovation Center grant, is just the first in a series of tests to determine if the ESP or similar devices can be used by the USGS to improve monitoring of waters across the United States. Results of the preliminary study show that the ESP can indeed collect samples needed by authorities, thus warranting more extensive field trials. With that objective, if all goes well, at least two ESPs will be installed for a month or longer in stream gage stations in Wyoming in 2018. The instruments will be programmed to collect samples multiple times per day and preserve the material for subsequent lab testing. Will high-frequency sampling yield new insights into the distribution and dynamics of a range of species and pathogens that can’t be gleaned by sending people to various sites periodically to collect water? The team suspects so. These early tests will help answer that question, and possibly lead to enhancing the stream gages with real-time detection capabilities. Using the ESP for quick detection of a dangerous freshwater pathogen could not have been foreseen 30 years ago when work began on this ocean research tool. Persistence in basic research and incremental technological improvements has created unanticipated opportunities for MBARI to make an impact on issues of the health of the planet and its inhabitants—something that illustrates the power and potential of fundamental research. MBARI engineers complete successful expedition to map the submerged portions of icebergs in Greenland using a new autonomous underwater vehicle.